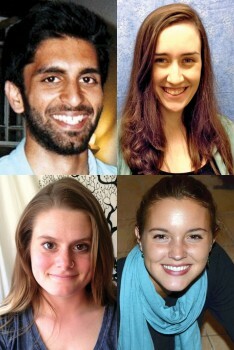 (clockwise, from top right) Christina Tavernelli, Annie Reading, Maisy Hughes and Waleed Shahid. As Fellows, they will work with social service agencies in the city, and get the chance to develop professional experience and leadership skills. Sociology major Maisy Hughes, from Langhorne, Pa., will work as a marketing and communications specialist with the Children's Crisis Treatment Center. The organization provides behavioral health services to families and children who have experienced trauma or abuse. Annie Reading, a native of Salisbury Md., will work with HIAS Pennsylvania (the Hebrew Immigrant Aid Society). The English major will serve as a refugee orientation and resource coordinator with the organization, which works to provide a safe and secure environment for all immigrants in the state. Waleed Shahid, a Religion major from Arlington, Va., will take a post as service coordinator with the Nationalities Service Center, which provides social, educational and legal services to immigrants and refugees in the Greater Philadelphia area. Christina Tavernelli, an English major from La Habra, Calif., will be a fundraising and communications fellow with the Mission First Housing Group, which develops affordable housing for people with special needs.